Abu Dhabi: Not many would have backed African Story to rise up to tell the tale in 2014 but he rose above the rest to give Godolphin a comfortable victory in the $10 million (Dh36.7 million) Dubai World Cup at Meydan. 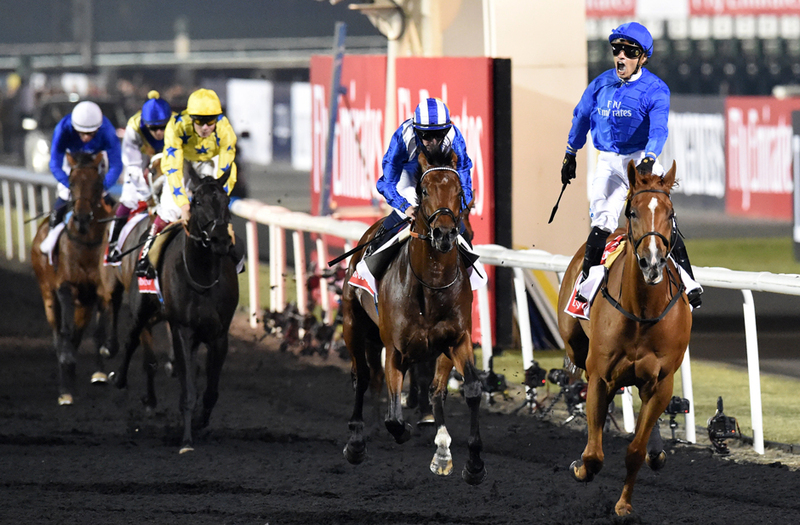 African Story was overlooked in the wagering after an eighth-place finish in the Al Maktoum Challenge Round 3 over the course at the World Cup distance before the mega event. However, when it mattered most he came up trumps, guided off the inside at the head of the straight to overtake pacesetter Mukhadram en route to a fine victory. Seven countries were represented in the race, but the result was a clean sweep for the ruling family of Dubai. It was the sixth win for His Highness Shaikh Mohammad Bin Rashid Al Maktoum, Vice-President and Prime Minister of the UAE and Ruler of Dubai, in the 19-year history of the world’s richest horse race. African Story won by 2 3/4 lengths and timed in 2:01.61 for the 1 1/4-mile distance at Meydan while Mukhadram was a clear second for Shaikh Hamdan Bin Mohammad Bin Rashid Al Maktoum, Crown Prince of Dubai, while Godolphin’s Charlie Appleby-trained Cat O’Mountain got up for third over Side Glance. Derby winner Ruler Of The World, who had a poor draw, was struggling from some way out under Joseph O’Brien. “It’s an amazing feeling and he just proved he’s the best,” said African Story’s jockey Silvestre de Sousa. “He was very unlucky here last time when he banged his head in the stalls, but he has proved he’s the boy. He has good track form having won the Godolphin Mile two years ago. He travelled well and quickened great and I am over the moon,” added De Sousa, who was standing up in his irons as they came under the wire and African Story, Trained by Saeed Bin Surour, bettered the previous World Cup record time at Meydan set in 2012 by Godolphin’s Monterosso by more than a second. “There has been a lot of pressure from a lot of people, but I thought two years ago this was the right horse for this race,” said Bin Surour, who had claimed six of Godolphin’s World Cup victories.